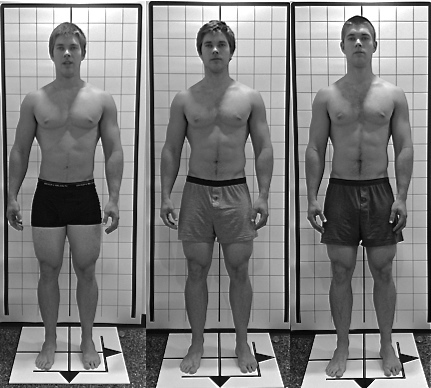 Examples of Postural Evaluations, from CrossFit South Bay’s Blog. Using a camera (or iPad for quick viewing) and grid as a backdrop, we view the front, back, and sides of your body looking for areas that are misaligned. This allows us to tailor the session(s) for you specifically. Drawing from the diverse fields of Chinese Medicine, Structural Integration, Aston-kinetics, Continuum™, Yoga Therapeutics, corrective exercise and neuro-physiology, I create a personalized program of exercises to help correct postural imbalances, re-educate your body’s neuro-myo-fascial system (nervous system, muscles, and fascia), release areas that are overworking and strengthen areas that have not been participating enough. This work is an excellent complement to any specialized athletic program that requires repetitive movements (such as swimming, cycling, running, yoga, power lifting, dance, etc.) as well as daily activities such as office work, driving, child rearing, and more. Hands-on bodywork designed to re-hydrate fascia, correct misalignments, balance your body and improve function. Using the heat and pressure of my hands, we re-hydrate areas of connective tissue, or fascia, that have become matted down, creating pain or “stuck-ness.” When the fascial layers can slide and glide again, you will experience improved range of motion, erasing of pain, and a restored sense of ease, fluidity and precision in your movement. My style has evolved from my experience as a Board-Certified Advanced Structural Integration Practitioner (in the tradition of Dr. Ida Rolf who pioneered work on fascia), Aston-Patterning Practitioner (I trained directly with Judith Aston who has been doing bodywork and movement since 1970), Nationally Certified in Massage and Bodywork, and many continuing education classes in Body Reading, Structural Integration, Bio-mechanics, Anatomy Trains™, Visceral Manipulation, Cranial Sacral, Continuum™ and Fascial Fitness. The latest scientific research in fascia and the nervous system along with my personal experience and years of working with clients has clearly proven to me that to create the most positive and lasting change in the body, the most effective and efficient way is through a combination of hands-on bodywork and movement education. I have done and continue to do just bodywork and just movement education, and far and away the best results come from combining them in a session. MovNat is an integrative fitness and physical education system based on the full range of natural human movement. We focus on locomotive skills like walking, running, balancing, jumping, crawling and climbing, and manipulative skills such as lifting, carrying, throwing and catching. MovNat’s objective is to reintroduce/refine your natural movement skills, working from the understanding that all movements pertain naturally to the real world. Everything starts with the foundational movements and you work at your own level. I observe and assist you in your home or workplace with this highly personalized approach. Ergonomic coaching improves your daily life so that it suits your body, affecting long-term postural alignment and preventing pain and imbalances at their source. We will address circumstances relevant to you such as: the set-up of your workstation, the way you sit in your car to drive, how to bend down to pick something (or your child) up from the floor, the position of your instrument and body if you play music, and more. Postural Evaluation only: $50 / 45 min. Postural Eval. + Corrective Exercise Program: $125 / 1 hr. Postural Eval. + Bodywork: $175 / 1.5 hrs. Postural Eval. + Bodywork + Corrective Movement Education: $195 / 1.5 – 2 hrs. gets working appropriately, the force of gravity can flow through. Then, spontaneously, the body heals itself.